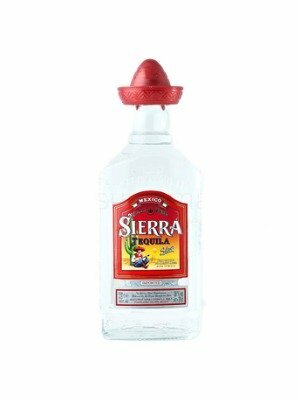 Sierra Silver Mexican Blanco Tequila is a popular Tequlia available from Amazon.co.uk in 35cl to buy online. Visit Amazon.co.uk for the best price for 35cl of Sierra Silver Mexican Blanco Tequila or compare prices on our other Tequlia products. Sierra Tequila Silver is a blanco, rested tequila from Guadalajara Mexico, the home of tequila. Created from the Blue Agave also known as, Agave tequilana Weber azul, which is the plant at almost all tequila is created from. There are many different types of agave and certain ones make better or different tequila. Sierra Silver is full tequila with a fresh aroma which is dominated by light chilli notes. These are all contributed by the Agave tequilana weber azul that âSierra Silver' is made from. It also has light notes of green apples and young pineapple. Shades of pepper spice up this tequila and give it that certain something that makes it tequila of full character. You can buy Sierra Silver Mexican Blanco Tequila online in most retailers and find it in the Tequlia aisle in supermarkets but we found the best deals online for Sierra Silver Mexican Blanco Tequila in Amazon.co.uk, DrinkSupermarket.com, and others. Compare the current price of Sierra Silver Mexican Blanco Tequila in 35cl size in the table of offers below. Simply click on the button to order Sierra Silver Mexican Blanco Tequila online now.